“I wanted to have everything my way.” When Mikayla started high school, she didn’t realize how much her decisions and actions could determine her future. As a freshman at Central High School in Capitol Heights, MD, Mikayla struggled to stay motivated in her classes – leading to failing grades. “At the time, I was only going to school to have fun and didn’t take my education seriously,” she recalled. 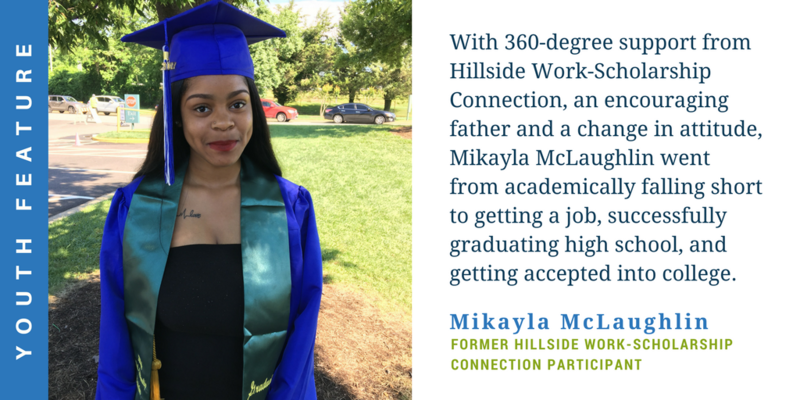 Mikayla’s father, Thomas McLaughlin, a single parent, recognized that Mikayla needed extra guidance during these formative years and introduced her to Hillside-Work Scholarship Connection. HW-SC’s intervention transformed Mikayla’s attitude and set her on a new path to a brighter future. When Mikayla first started the program, the top priority was getting her grades up. Mikayla’s Youth Advocate, La-Toya, worked with the school and Mr. McLaughlin to create daily progress reports to make sure that she was completing all of her assignments and getting additional help in the subjects she was struggling with. Mikayla’s father immediately noticed a drastic change. “Her grades transformed in a short period of time,” said Mr. McLaughlin. “She went from getting 30s and 40s to 80s and 90s.” La-Toya not only helped Mikayla identify subjects where she struggled and develop strategies to improve; she also reinforced the importance high-school grades have on getting into college and achieving her goals. La-Toya also made sure that Mikayla had the tools that she needed to reach her personal goals for her junior and senior years. Mikayla wanted to go to college, so La-Toya encouraged her through the resources that HW-SC provided, including college tours and helping her to complete college and scholarship applications. Mikayla also got a job at Wegmans Food Markets through HW-SC, which offered her the opportunity to take on more responsibilities and learn workplace skills. Through the ups and downs of high school, La-Toya and other HW-SC staff members provided the 360-degree support Mikayla and her family needed. Come on, let’s get back on track. Let’s get you where you want to be. Because I’m not only supporting your dreams, I’m supporting your dreams coming to fruition. Download the case study about our investment in Hillside Work-Scholarship Connection.